Copra is the trade name for dried coconut meat or kernel. It is not of the chief coconut products of trade, and ranks next to soybeans as a world source of oil. The first step in making copra is to remove the husk form mature nuts; this operation is done at the orchard site soon after the fruit is harvested. Husking is the same whether the coconuts are to be made into copra, shredded or shipped fresh. The second step consists of opening the husked nut by striking it at the “equator” with a heavy knife. This operation, usually carried out by natives, splits the nut in two; the milk spills out on the ground. The open halves are placed in trays and turned up to the sun. The trays can be stacked one upon another and quickly covered with a roof in the event of sudden rain. After 4 to 6 days of sunning, the partly dried meat is removed from the shell halves by prying with a sharp curved steel spoon. The meat is further dried by sun or if frequent rains prevent sun-drying, it is cured by the use of one of several types of the meat placed under a shelter. The shells and husks of the nuts are frequently burned to provide the heat used in flue curing. Artificial-drying method is faster than sun drying, but the copra is often discolored and of poorer quality. The husked coconuts are split into halves and arranged upside down on the tapahan one over the other. After 4 to 6 hr of continuous heating the meat is removed, sliced into small pieces and drying is resumed (Tablante and Nuestro 1953). 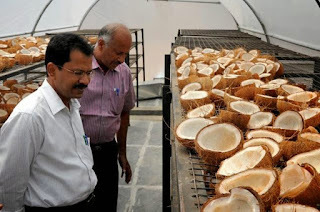 The drying time for coconut halves in platforms using artificial heat with rapidly circulating air may be a short as 40 hr. the coconut meat is reduced from 50 to 40% moisture in 1 hr, to 20% moisture in 5 hr, to 10% moisture in 10 hr, and to 5% moisture in 40 hr (Aten et al. 1958). Kiln drying is supplementing and replacing sun drying in many cases and thereby affording better control of the operation. Optimum economic load for farm drying kilns is 200 coconuts, or 400 halves, arranged on 4 grills and heated to 122o to 138oF. The quality is comparable with that of the best sun-dried product. Kilns are fired 4 hr per day, and 26 days per month. Each kiln should dry 5,000 coconuts per year-4 months from june to September-and have a life of 10 yr.
As with sun drying, kiln-dried coconut halves are dried until the meat loosens, then the shells are discarded and drying is continued to a moisture content of 5 o 7%. Treating copra with sulfur fumes during drying prevents discoloration, wards off insects, and temporarily protects the product against mold and put refaction. However, it should not be used as a means of attempting to restore brightness to already discolored copra. The water content of well-cured copra is reduced from 45 or 50% to 3-5%, and the oil content increased from 35 to 60-65%. However, a large quantity of the copra shipped contains as much as 10 % moisture, which adds greatly to the likelihood that it will mold. When the moisture content is about 4%, put refaction is likely to occur and the oil is apt to become rancid. The dried product is chopped into rather uniformly sized pieces, sacked, weighed, and shipped. The sacked copra is carried on small sailboats, or overland to local oil mills or to seaports for export. Flue-cured copra sells at a higher price than sun-cured. It is used for oil expression or for the preparation of shredded coconut for use by the bakery and confectionery trades. Most shredded coconut for food use is prepared by more sanitary means (Moore 1948). The most significant advance in copra drying techniques for many years has been made by crop drying engineers using the latest and safest methods. The economical and safe oil-fired, hot-air system incorporates a process of circulating hot air, which not only heats the product but also carries off the moisture liberated in the process. Studies conducted on mechanical drying of coconuts have shown that good quality copra can be obtained by drying the nuts at an air temperature of 158oF for the first 8 hr and then completing the drying at 140oF. 0 Response to "Copra Production"